April 2nd – Yard Sale Season is ON! See, I really like to sleep. So setting the alarm clock and getting up at the ungodly hour of 6 or 7 or even 8am to try to beat the competition to local yard and garage sales is pretty much my idea of a living hell. Yet, somehow, every spring a girl’s fancy turns to saling. 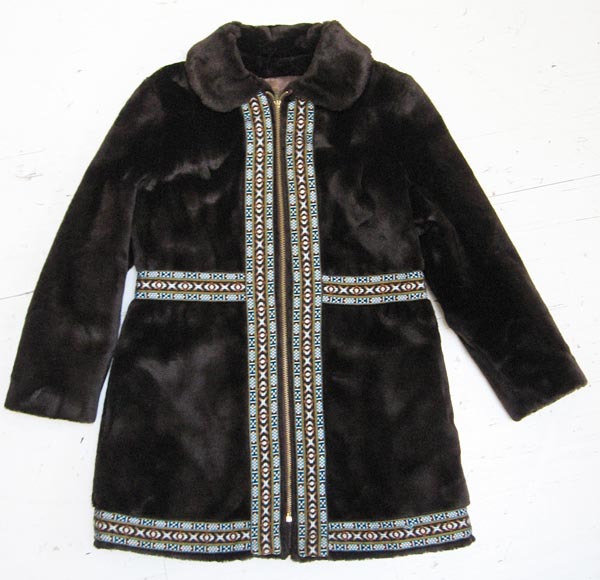 I’ve been looking for one of these 1969s hippie-trimmed Nordic faux fur zip-front jackets for years. Finally found one! So here I was up at 7AM, up before the turkeys, and out the door, pre-coffee, to check out the estate sale down the road. Estate sales are almost always worth the effort, as they usually involve a much broader selection and a motivated seller. Drove up to the lovely old farmhouse and there, hanging on clothesline all around the wrap-around porch was a bunch of clothes. You can’t really tell until you get closer if it’s Wal-Mart circa 2005, or Wards’ circa 1972. 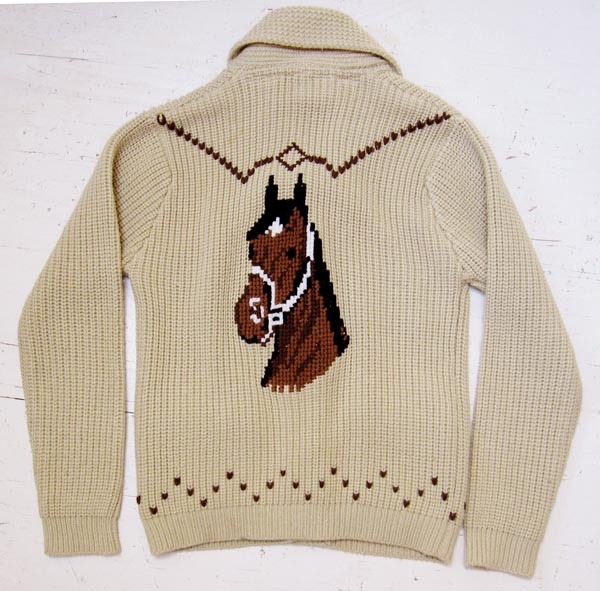 Fortunately it was the latter, so I made a big pile and with a little friendly haggling was soon the proud owner of about ten women’s jackets and 5 Western shirts.Wanna see? 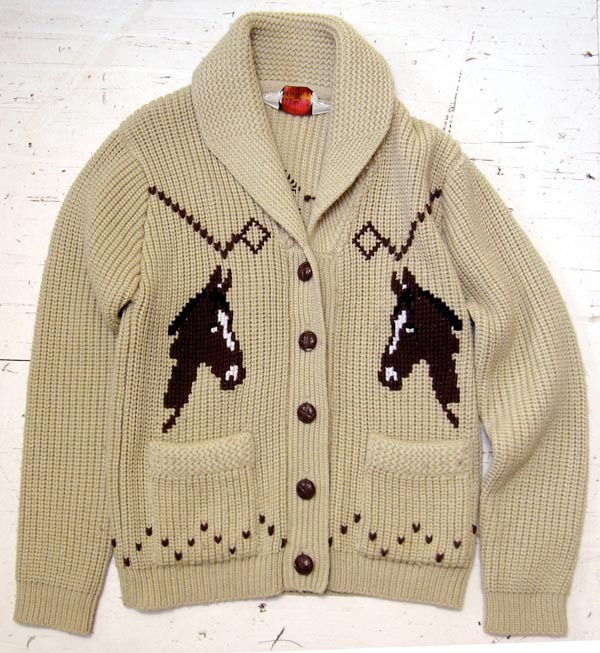 Lovely Cowichan-style knit sweater with horses on front and back. Made by Miller, and a bargain to be had at the Mystery Spot for a mere $44. 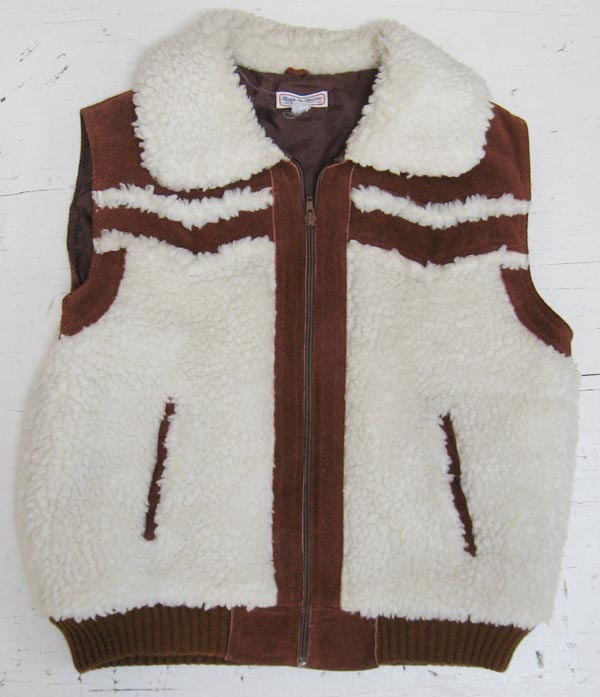 This 1970s suede sherpa vest is all kinds of wonderful.